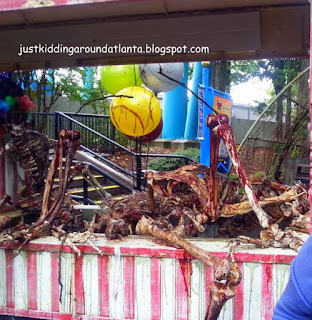 We got a sneak peek at the 2015 Six Flags Fright Fest this past weekend, and it's awesome! The scary surprises start as soon as you arrive at the front gate. Step inside the park and you'll find caskets, wagons filled with creepy cargo, and more. Spider webs drape the buildings on the promenade, as well. 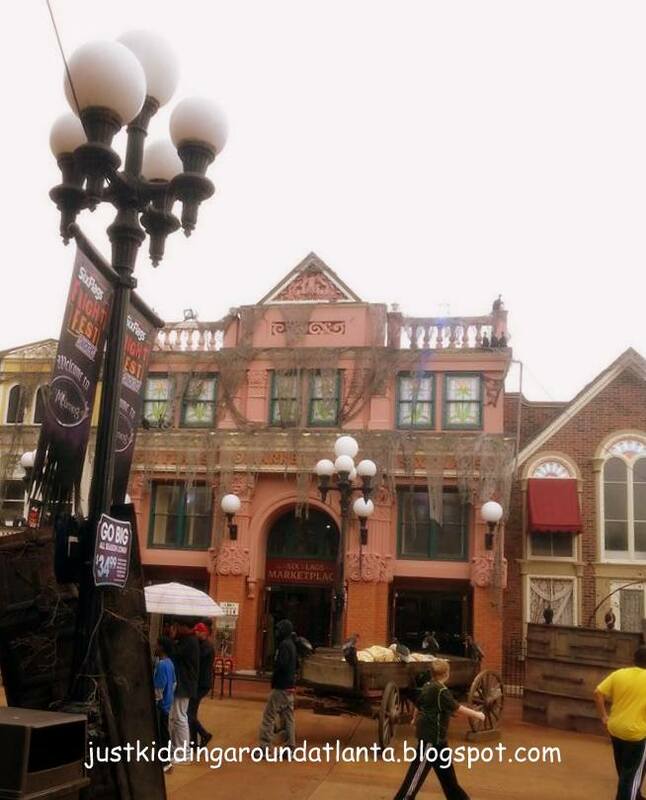 The haunting music that plays throughout the park will definitely get you in the mood for Fright Fest! Creepy spots like this are found throughout the park! Daytime thrills include family-friendly activities such as the Lickskillet Harvest Festival. It is a fun place to take pics with a silly scarecrow, play on the playground and paint your own pumpkin to take home with you! Offered Friday from 6 – 10 pm and Saturday and Sunday 12 – 6 pm. Spooky Stories - Bugs Bunny World Theater – Fun, scary stories are told Friday at 8, 9 and 10 pm, and Saturday and Sunday at 1, 2, 3 and 5 pm. McBoogles –Hanson Cars – Read about the adventures of the McBoogle family as you take a leisurely drive on the Hanson Cars. Friday 6 – close, Saturday and Sunday 12 – close. Things get much scarier for Fright by Night after dark! Beware the Lost Souls who like to travel in the fog of night, between the Mourning funeral and their graves in the Southern Cemetery. Cross through The Battleground, where the undead have no love for the living and the battle for Fright Fest has begun! Travel back in time to 1692 and venture through the village of Salem, where chaos has ensued with the Salem Witch Hunt. In Big Top Terror there is a wicked Ringmaster who draws onlookers in with his hypnotic voice and wicked gaze! In Subterrestrial, watch out or you may become the newest creature to live below with the sewer monsters! In addition to all of the Fright Fest thrills and scares, there are also tons of great rides for your family to enjoy while you are there. 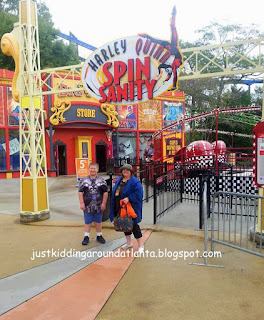 My favorite is always the Harley Quinn Spinsanity!! As someone who doesn't like heights or rollercoasters, people can't believe how much I love spinning crazily in circles over and over, but I LOVE LOVE LOVE it! 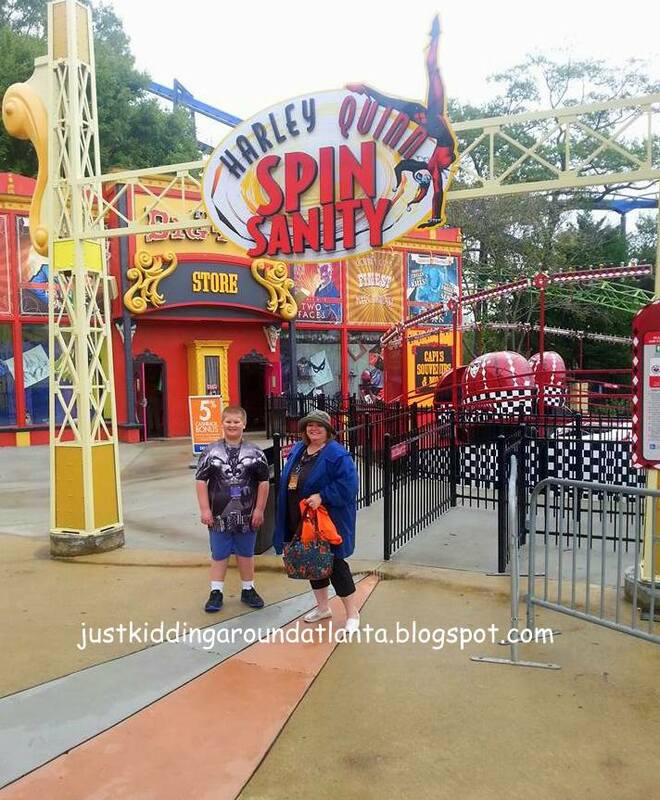 My friend Lisa's son Jeramy rode this with me three times in a row, til we could hardly walk straight! If you like roller coasters, you will be in heaven at Six Flags over Georgia. 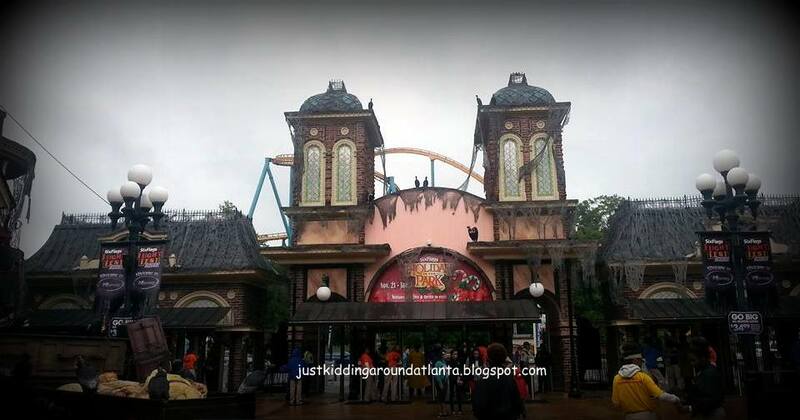 They have so many – the Joker Chaos Coaster, The Mind Bender, The Great American Scream Machine, The Georgia Cyclone, The Georgia Scorcher and several more! Just know that after dark things will get scary - so if you have littles, plan to go early when things are family-friendly, and leave by dinner time. 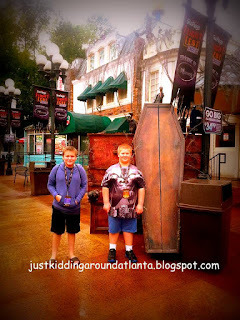 If you have teens, they will probably like the after dark fun best, especially if they like to get scared! 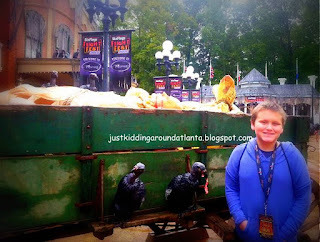 All in all, Six Flags Fright Fest will be a great Fall fun destination for the whole family. Check their website for hours, directions, and ticket prices! Six Flags is located at 275 Riverside Parkway, SW, Austell, Georgia 30168. Click here for directions. Sunday, October 11 Noon to 10:00 p.m.
Sunday, October 18 Noon to 10:00 p.m.
Sunday, October 25 Noon to 10:00 p.m.
Sunday, November 1 12:00 p.m. to 10:00 p.m.
We didn't complete all of the items for the Scavenger Haunt, as the rain finally drove us out. But we had a really fun day while we were there! I hope you and your family have a fabulous time if you go! 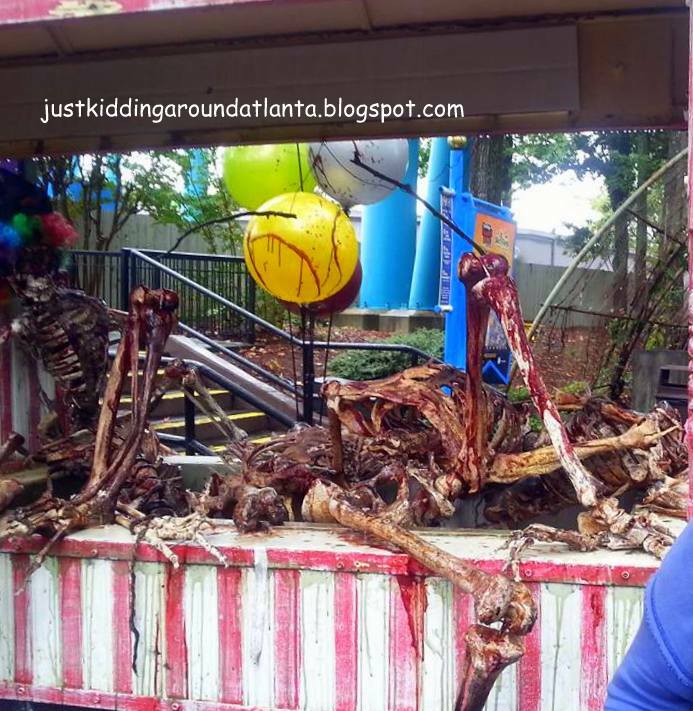 What's your favorite ride (or scare!) at Six Flags? Leave a comment and let me know! 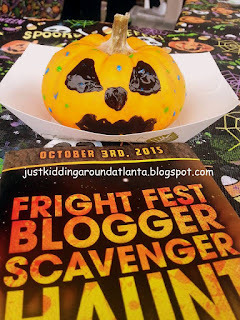 We received a day at Fright Fest to participate in the Blogger Scavenger Haunt in order to share the experience here on the blog. No other compensation was received!